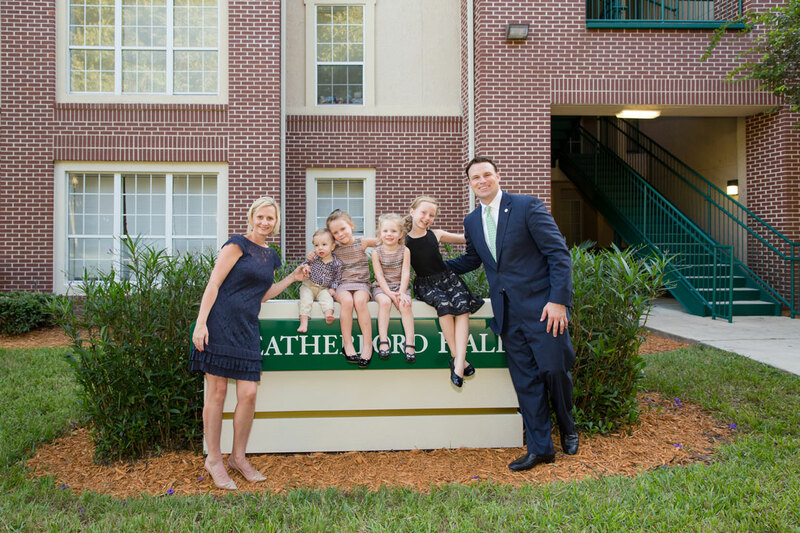 Will Weatherford, 2002 Davis College of Business graduate and 2015 Jacksonville University Distinguished Alumni, is a JU stand-out and the namesake of Weatherford Hall at the Village Apartments on campus–a fitting tribute to someone who daily works toward building stronger communities and inspiring others to lend a helping hand… and at age 38, he has gained more momentum now than ever. 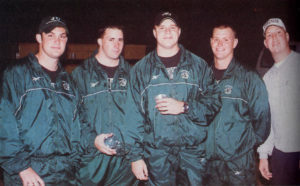 Long before Weatherford became the youngest Speaker of the House in any state in the U.S., at the age of 32, he excelled at football, and JU recruited him to play defensive end in 1998. 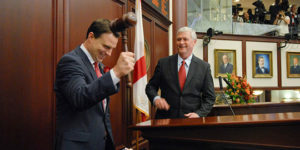 By his senior year, Weatherford was team captain, vice president of student government, and roomed with teammate Jason Bense, son of Allan Bense, businessman and Florida Speaker of the House from 2004 to 2006. 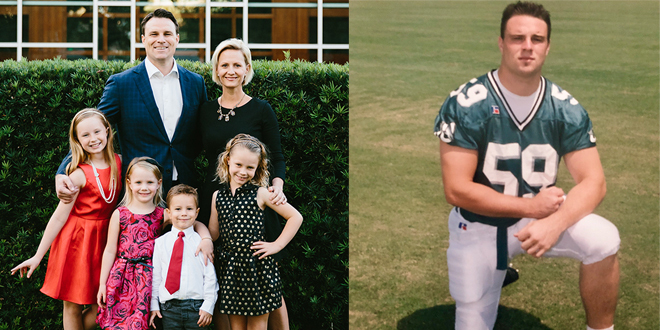 Weatherford’s football days, his JU experience, and an endearing connection to the Bense family—which became more than a college friendship when Weatherford married Jason’s sister Courtney—worked together to impact his perspectives regarding policymaking, public service, and social responsibility. The U.S. Census Bureau reports that, in 2016, nearly 15 percent of adults and more than 20 percent of children in Florida lived in poverty. 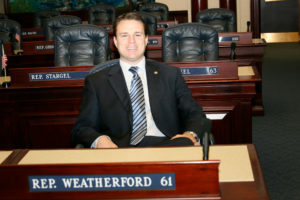 In his remarks to the 2014 Legislative Session, as the 84th Florida Speaker of the House, Weatherford challenged his peers to make “a concentrated effort on fostering upward mobility and disrupting generational poverty.” Will’s commitment to improving quality of life for his fellow Floridians has not dulled since leaving office. “One in five of our fellow Floridians are living under the poverty level. One in five. That is unacceptable to me and it should be unacceptable to everyone in this room regardless of what party you come from,” he said during his tenure as Speaker. So, what do those statistics mean in terms of dollars? The U.S. Federal Poverty Guidelines state that a family of four making less than $25,000 annually is considered below the poverty threshold. Weatherford has spent most of his adult life advocating for marginalized populations, demonstrating the same grit and resolve in policy and business as he did on the football field. From left: Seniors Chris Brown, Sean Burns, Will Weatherford, Josh Hoekstra, Shawn McPhillips. His unique approach to help solve difficult issues is something Weatherford began developing during his time at JU. He stepped up to one such challenge on a Tuesday morning in 2001. He was still at home with roommates because his classes that day didn’t convene until mid-morning. “I remember hearing one of my roommates say that something happened at the World Trade Center. We were glued to the TV when I saw the second plane hit. No one went to class that day,” he says. Instead of having football practice later that afternoon, a team meeting was called. A decision had to be made about whether or not to forge ahead with a regularly scheduled game that Saturday. The opposing team was waiting to board buses and head toward Jacksonville. 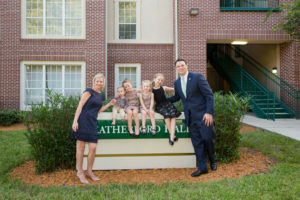 Since those difficult days, Weatherford embarked on a newsworthy career and has been a guest speaker on campus many times, including with the Jacksonville University Public Policy Institute. He was also instrumental to the University securing more than $10 million in public investment that helped launch its EPIC (Entrepreneurial, Policy, Innovation, and Commerce) initiative in 2014. Designed to attract and retain qualified students in high-demand STEM fields, it is a program that continues today with success. Projects range from educational video series to oyster reef assessment to law enforcement recruitment. Each project falls under the broad and collaborative umbrella of the Florida EPIC Program at JU. Today, 15 of JU’s EPIC participants are student athletes, some attending on scholarship. Thanks to the tireless efforts of Weatherford and University leadership and faculty, these students now receive an added benefit that Weatherford never imagined during his time living on campus. 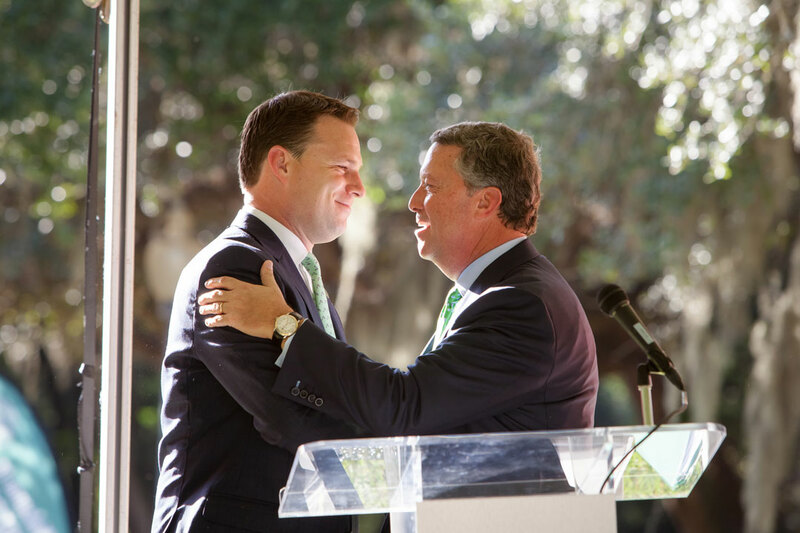 Many other engaging projects were funded and supported around the state during Weatherford’s time in office, but the EPIC program at Jacksonville University, he says, was the most well-conceived and bold, which he credits to the University’s visionary leadership. What’s the next step for Weatherford? He views life in chapters, he says, and is now managing partner of a private investment company, Weatherford Capital, founded in 2014 by Weatherford and his brothers Sam and Drew.”I still care about public policy and I’m still engaged politically. But my goal right now is to build a business and to be a good dad and husband,” he says. Will and Courtney have four children—ages ten, seven, five, and three. Weatherford says that he believes in fiscal responsibility, limited government, and less regulation, but he is equally passionate about social responsibility. “Business, government, and society have a role to play to help bring opportunity and justice to all members of our society, and not just some.” For now, he will continue serving on multiple boards and in a variety of leadership positions. 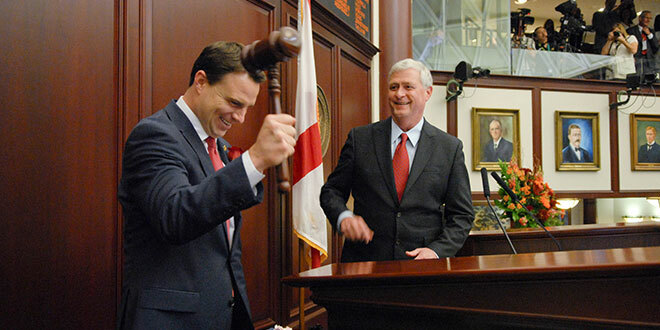 One of those boards is the Florida Council of 100, on which he and President Cost both serve. He will also continue supporting Metropolitan Ministries in Tampa, Operation New Hope, Ready for Work, criminal justice reform, education reform, and combatting generational poverty. As a Tampa Bay journalist once described Speaker Weatherford, he’s “better looking, has more friends, and has gone further faster than anyone in recent Florida politics,” but to the Jacksonville University community, he is much more. He is one of many dedicated alumni who exercise JU spirit and commitment in the real world. His legacy on campus goes beyond a name on a building or in a magazine, and he is one more extension of the University’s smart, creative, fearless student culture. It is a culture of future and present leaders who are not afraid to extend a hand of service or to face multi-layered issues challenging society today. PHOTO CREDIT: Featured image provided, in part, by Darby Marsh Photography and the Weatherford family.